Following its global debut in Thailand earlier this month, the refreshed Mitsubishi Triton has arrived at the ongoing Kuala Lumpur International Motor Show (KLIMS 2018) as part of an official preview. 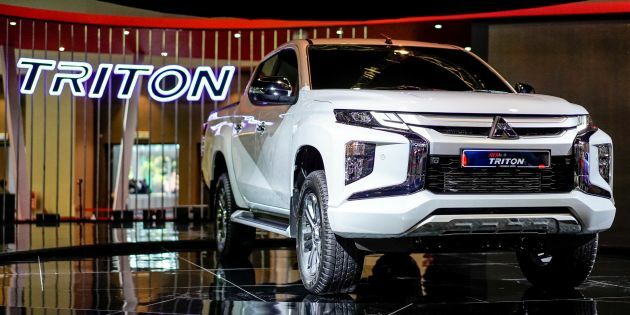 There’s more too, as Mitsubishi Motors Malaysia (MMM) has begun order taking for the pick-up truck ahead of an official launch in the first quarter (Q1) of 2019. We’ll jump right into the most important bit: the estimated pricing for the new Triton is from RM100k to RM140k (on-the-road without insurance), and there will be five variants on offer. In terms of specifications, MMM has confirmed that we will be getting the 4N15 2.4 litre MIVEC turbodiesel engine, as well as the new six-speed automatic transmission that replaces the five-speed INVECS II unit. Other features include the new Super Select 4WD II from the latest Pajero Sport with Off-road Mode (Gravel, Mud/Snow, Sand and Rock), plus a suite of advanced safety systems. The latter is an attractive proposition as it includes Forward Collision Mitigation, Ultrasonic Misacceleration Mitigation System, Rear Cross Traffic Alert, Blind Spot Warning with Lane Change Assist and Auto High Beam. The new Triton sports a bolder look that proudly showcases the brand’s Dynamic Shield family face. Highlights include a bonnet that has been raised by some 100 mm for better presence, slim bi-LED headlamps with LED daytime running lights, LED taillights and new-design alloy wheels. Inside, the Triton receives a redesigned centre console with new switchgear and air-conditioning vents. For a more upmarket look, soft-touch materials are used on the armrests, centre console sides, door inserts and parking brake lever. Given that most truck owners live in the urban jungle, touches such as a smartphone tray with USB ports below the central switchgear at the front; smartphone tray with a USB charging port behind the centre armrest, as well as a rear air-con blower with roof-mounted vents have been added as well. As mentioned earlier, the Triton is now open for booking, with prices ranging between RM100k and RM140k. An official launch will only take place in Q1 of next year, and the pick-up truck will arrive as a fully-imported (CBU) model from Thailand. Interested? Still dreaming? Arena have been out of sale since 10 years ago. Stop dreaming & talking nonsense. Hilux dead for sure. Triton and Ranger facelift become tougher and bold, Hilux facelift become pig face and fugly. To be priced at 140k, I hope the top-spec Triton would be really well-equipped. Because it will undoubtedly be compared to the 145k Ranger Wildtrak Biturbo, which we all know is currently the best pickup on sale. Pickup used to be same price same B-segment sedan, now it closer to C-segment sedan. I am pretty sure that this truck scored / will score very bad in pedestrian safety in NCAP test. After seeing it live, it looks like the old triton with new body panels. I think its the old triton with new drivetrain and new panels. Even the interior looks dated. It’s so bad that even the navara got a better quality interior than this triton. You sell roti canai RM1, 5 years ago. Now you are creative. You add susu cheese & comes with sup ekor. Do you think you can sell RM1? The MIVEC 4N15 alone is much more advance than the previous 4D56. Wow talk about an ugly vehicle! but its less ugly than the one its replacing….